This mine is in the area of Rt. 322 and Garnet Mine Road. Part of the wall in the background can be seen on the east side of Rt. 322. This view is approx. 1940 after the mines were long closed. Note: We have all been down Garnet Mine Rd. at sometime or another. It is hard to imagine there were mines in Delco over 100 years ago. The mines were more quarries than actual mines. The article below is over 115 years old. Also I'm always looking for typists to add articles and information to my site to help researchers etc. I have been collecting for over 45 years and have stacks of articles etc. I want to add to my site. As my site is free this would be volunteer typing even an article a week would be a great help. Email me at keith106@rcn.com if you are interested. Pennsylvania promises to take the lead in garnet mining, according to the rich yields that have already been reported in sections of Delaware County and the discoveries recently made. The Boothwyn garnet mines were the first to prove financially successfully some five or six years ago. Before these had become practically exhausted the winding veins of rich garnet had let the miners with their tracks and hand cars a mile or more into the hillsides in various directions. Then more profitable garnet was discovered along the Brandywine Creek, beyond Boothwyn, and Lansdowne next reported rich finds and still more recently reports of garnet discoveries promise to attract considerable attention to one of the most picturesque of the historic sections of Delaware County’s beautiful old Sycamore Mills. Singularly enough, this is the section of the State where the value of anthracite coal as a fuel was first practically demonstrated, according to an early report of the Pottsville Board of Trade. At that time the present Sycamore Mills section was known as Bishop’s Mills several mills at that time being dotted along the Ridley Creek in the locality and utilizing its abundant water power. A grist mill, a saw mill and an iron mill were in operation at the time of the cost test. According to the early records, this occurred after Thomas Bishop, the younger had acquired absolute ownership of the property. His ownership began in 1786, and a frame third story and an over chute were then added to the mill, the eastern end of the latter resting on three stone piers, the public road passing underneath. It is further recorded that during Thomas Bishop’s ownership of the mill many changes of management took place. He himself operated the mills until 1802, when Francis Bishop began operating them. In 1817 Thomas was again conducting the grist mill, while in 1811 he operated the saw mill and Amor Bishop the grist mill. Tradition says that the employer, in charge of the furnace of the Delaware County Rolling Mills, when the load of anthracite coal first came to the works late in the afternoon, threw into the fire a considerable quantity of the material with the oft expressed opinion that the “boss had been fooled,” an opinion which became more and more confirmed when the coal refused to ignite, although frequent attempts were made to kindle it. Late in the evening the fireman gave up in despair and went to bed. An hour or two later, being restless, he arose and went to the mill, when he found the furnace door red hot, the building intensely heated and the woodwork almost ready to burst into flame. There had never been such a fire in the mill before. From then on Enos Helms was sent to Mauch Chunk with a five-horse team and hauled the fuel for the rolling mill from that place. The coal cost $2 A TON AT THE MINE. According to recent predictions a profitable industry may be established here if the garnet finds continue. The garnet which has been discovered here is of excellent quality, on the gem order; but if it should later be mined in paying quantities it will probably be utilized as the other garnet of Eastern Pennsylvania – for the manufacture of a fine grade of sandpaper and the best of emery for polishing purposes. None of the garnet mines so far discovered in Delaware County have yielded valuable jewels, like those of Cornwall and Bohemia, although some of the deep red stones taken from the Boothwyn and the Lansdowne mines and along the Brandywine are so perfect when cut that they closely resemble the most expensive rubies. 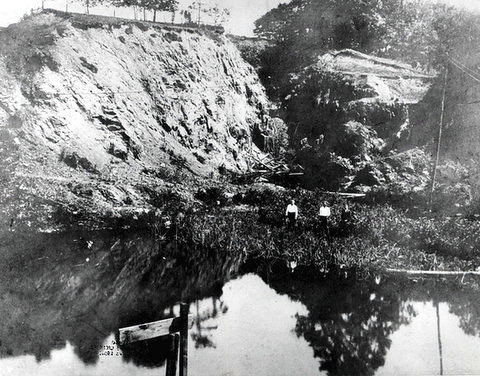 The mining of garnet in Eastern Pennsylvania is an industry of which little has been heard so far, although large profits have been secured by the owners of the various mines for several years past. When a rich vein is struck the big profits are not derived from the so-called gems, but from the superior grade of garnet for the manufacture of the best polishing papers. It is true that the workmen in the mines are ever on the lookout for the big flawless stones, and that they preserve the best of the brilliant, glistening specimens as valuables; but the majority of the large stones are shoveled into the buckets with the “garnet dirt” without the slightest ceremony, and ground up with the inferior ones. In preparation of the garnet for commercial purposes, after the heavy buckets of garnet are wheeled from the different caves on hand care, they are lifted from the mines by derricks and swung in the washing troughs, where the worthless soft dirt and the garnet in the mass is then transferred to the grinding machines, where it is ground to the desired degree of fineness. There is abundant water power at the Sycamore mills for establishing the machinery for utilizing the garnet if it is discovered in paying quantities.